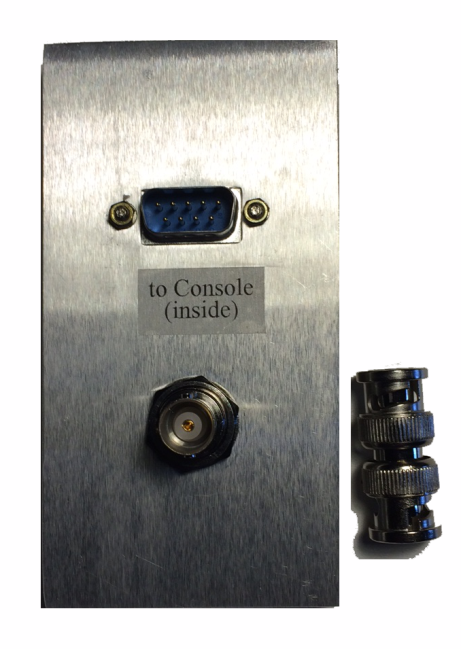 The J20 Connector Panel comes with both an antenna and a remote sensor cable extension (not shown). The J20 Connector Panel is a 2.25 x 4.25 inch aluminum panel with both a 9 pin and bnc antenna connectors to facilitate mounting your weatherstation in a larger trailer, or for a more professional appearance. The panel comes with an Antenna Extension Cable and a Remote Sensor extension cable. The J20 supplies a second remote sensor cable (one comes with the weatherstation) and an antenna extension cable. Make a permanent connection between your console and the J20 Connector Panel, then connecting outside the trailer is easy and professional looking. The J20 is sized to fit in an electrical outlet box with a watertight seal (locally available).